When three young entrepreneurs opened a restaurant in Dupont Circle last year and named it DGS Delicatessen, they were tipping their hats to a DC institution. The letters “DGS” evoke cherished memories for many Washingtonians—recollections of a neighborhood corner grocery, a friendly shopkeeper and his wife, a bright orange-and-green sign and delicious penny candy. Before franchises and chains, you could find “mom and pop” shops on many corners across Washington. Shopkeepers often lived above their stores, and their children helped in the store after school. In an oral history, Sidney Gimble remembered that, in his parents’ store, his job was to be behind the candy counter waiting on kids as they came in with their pennies. Eastern European and Russian Jewish immigrants opened grocery stores in all four quadrants of the city and practiced their English by reading food labels. These families worked hard, long hours, closing for only half a day on Sunday to relax together. 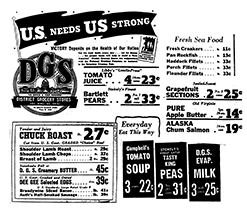 Business for the independent grocer was not easy and so, in 1921, a dozen Jewish grocers met in the back of Mike Hornstein’s store to form the cooperative District Grocery Stores, also known as DGS. DGS secured buying power and fought the discrimination that Jewish grocers often faced from wholesalers. Members also benefited from joint advertising by purchasing full-page ads in local newspapers that featured specials at all DGS stores. Banquets at hotels like the Mayflower and Willard, Sunday picnics at Hains Point and playing in local sports leagues created a sense of community among the Jewish grocers and their families. But 20 years later, with the impact of the 1968 riots and supermarkets’ extended business hours, DGS could not afford to stay afloat. In 1972, members voted unanimously to dissolve the cooperative. Today, while “mom and pop” stores are a rarity, DGS Delicatessen brings memories of a Washington dotted with orange-and-green DGS signs. I’m attempting to find my genetic great-Grandfather who is described by a family member as a Jewish Man with a grocery on C Street SW. She said the name was like a car dealership name like Chevrolet. Our DNA analysis shows Ashkananzi Jew. My grandmother was married to someone else so this was kept secret. You may want to contact the Jewish Historical Society of Greater Washington. They may have more information for you. Claire Uziel has been the Jewish Historical Society of Greater Washington’s Assistant Archivist since 2005. When she’s not taking care of the community’s history, she takes care of the Society’s website. Claire grew up eating from Ashkenazi and Sephardic traditions and is grateful for an extended family that loves to cook.